PACS stands for Picture Archive Communication System and is the modern method by which radiological images are stored. The introduction of PACS revolutionized the practice of Radiology. Prior to its (fairly recent) development, radiographs were performed using film plates, which were then developed in a darkroom, while cross-sectional images were printed onto a special film. These films were the only available copy of the imaging study, and frequently went missing before they made it to a Radiologist’s office for reporting on a light box. Reporting imaging studies with multiple sheets of film (for example, oncology CTs which often consisted of 8 or more sheets) was quite a cumbersome process, especially when comparison to one or two previous studies was required. 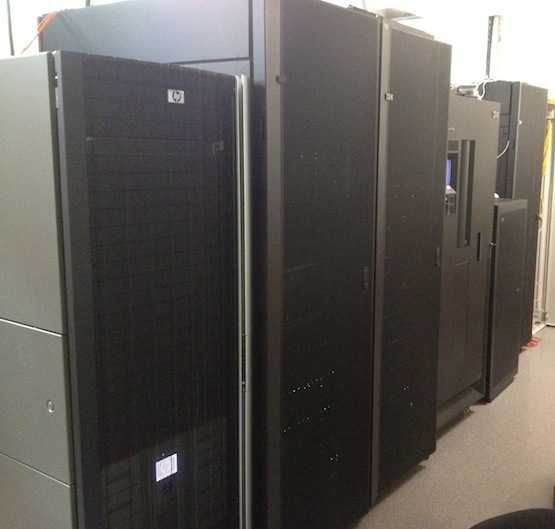 With PACS, the images are archived in a large carefully air-conditioned room in the department (below) where huge storage devices with 150 terabyte of memory are kept. When reporting imaging studies, the Radiology consultants and registrars use a pair of high-resolution (3 megapixel) monitors with voice-recognition dictation systems (see below). 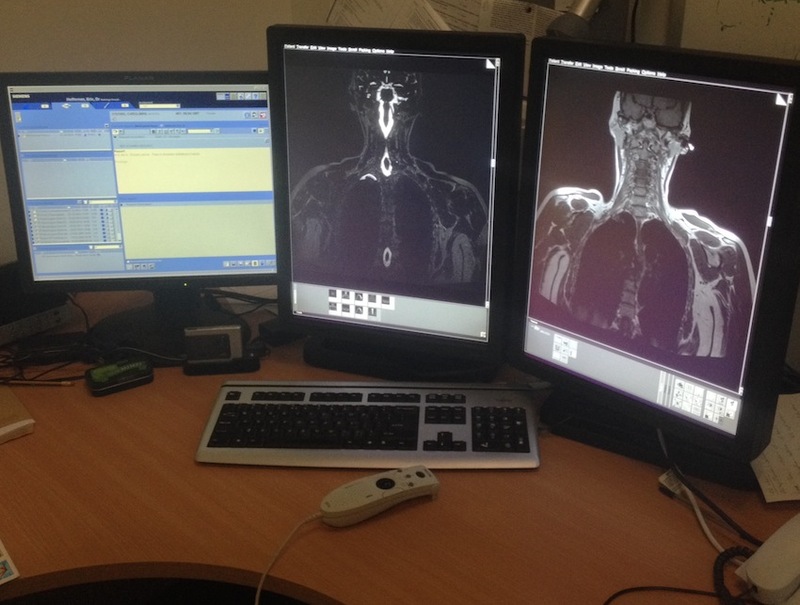 These workstations include post-processing software, for example to allow 3D review of imaging studies. Any previous similar studies are automatically loaded to the workstation for comparison. When we are happy with the written report, we click a button to finalize it. At that point, the final report is available on PCs hospital-wide for the referring clinicans to review. A copy is also printed, to be filed in the patient’s hospital chart. The National Integrated Medical Imaging System, or NIMIS, is a nationwide PACS system which will eventually allow imaging performed in any hospital in the country to be viewed at any other hospital nationwide. At the moment, it is not yet available in every public hospital in Ireland, however in the next few years the NIMIS project will be completed as the last few Radiology departments change their current PACS systems to the NIMIS system. This has obvious advantages, as it will reduce delays in treatment while waiting for patients’ imaging to be sent from other institutions, and will also reduce the number of unnecessary duplicate studies carried out.